KIEV, Ukraine -- A figurehead of the pro-Russia rebels in Ukraine was hospitalized after his car was shot at and crashed, supporters said, underlining the lawlessness of the separatist territories where armed groups are vying for power ahead of rogue elections there next month. 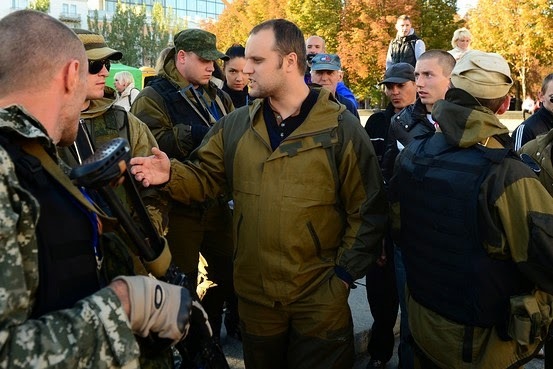 Pavel Gubarev (C), speaking to residents and reporters in the rebel stronghold of Donetsk on Oct. 4. Pavel Gubarev, a former advertising executive in his 30s, became a separatist leader when the anti-Kiev movement was in its infancy in the spring, but was later sidelined by Russian citizens as the armed insurgency took hold. He was driving in a rebel-held part of the Donetsk region on Sunday night when another vehicle cut his car off and opened fire, according to his wife Ekaterina, writing on Facebook, and aides quoted by Russian media. Gubarev, who heads a political organization called Novorossiya, or New Russia, wasn’t shot, but his driver lost control and crashed into a concrete pillar, Gubarev’s wife said. She wrote on Monday that her husband was unconscious and on a ventilator in intensive care, in stable condition. Russian news agencies said he was hospitalized in Rostov-on-Don. Alexander Zakharchenko, so called prime minister of the self-proclaimed Donetsk People’s Republic, was cited by Russia’s official RIA-Novosti news agency as saying they were trying to clarify what happened. “If it is true then it is a tragedy,” he was quoted as saying. Ukrainian security officials said disparate rebel groups are increasingly fighting each other for control of territory in eastern Ukraine ahead of elections they have scheduled for their own territory in early November. Separatists were left in control of several towns and cities, including two regional capitals, after Kiev signed a cease-fire in September. They have vowed to ignore national parliamentary elections set for Oct. 26. “They fight for the control of certain towns to rob them; they put pressure on businessmen,” Ukrainian security spokesman Col. Andriy Lysenko told reporters in Kiev. Fighting between rebels and Ukrainian government forces has been subsiding ahead of a meeting between the Ukrainian and Russian presidents later this week, though scattered shooting has continued. Col. Lysenko said Ukraine had seen evidence that Russia had started to withdraw thousands of troops massed on the border, following an order by Russian President Vladimir Putin on Saturday. Ukrainian President Petro Poroshenko on Monday proposed Stepan Poltorak, head of the National Guard, to replace Defense Minister Valeriy Heletey, who was dismissed Sunday. Parliament was expected to vote on the nomination on Tuesday. In a further sign of both sides tamping down tensions, Russian Energy Minister Alexander Novak said Moscow was prepared to accept a smaller debt payment from Kiev before it would restart natural-gas supplies. Russia reduced the first tranche amount from $2 billion to $1.454 billion. Ukraine’s Energy Minister Yuri Prodan welcomed the move, while saying it wasn’t enough to resolve the crisis, according to the Ukrainian website Apostrophe. Last week Mr. Poroshenko said that Ukraine and Russia were very close to settling the natural-gas issue, adding that he expected further progress at the Friday meeting in Milan, where he and Mr. Putin are to attend an Asia-Europe summit meeting with European Union leaders. Russia cut gas supplies to Ukraine earlier this year amid a dispute over pricing and back payments. Still, Russia’s consumer-protection regulator said Monday it was banning all imports of cheese products from Ukraine, citing sanitary issues and other alleged violations. Bans by the regulator, Rospotrebnadzor, have frequently coincided with political disputes with the country whose products are restricted.